Home CDN , children , crafts , feature , holiday , holidays , homeschool , March , papercrafts , printables , US , worldwide March 31st - Featuring Eiffel Tower Freebies! March 31st - Featuring Eiffel Tower Freebies! -- On March 31, 1889, the flag was hoisted to the top of the Eiffel Tower,. It was built as the centerpiece for the Exposition Universelle, or World's Fair, held in Paris, to mark the centenary of the French Revolution. Originally painted a deep red color, thought to be more protective against rust. 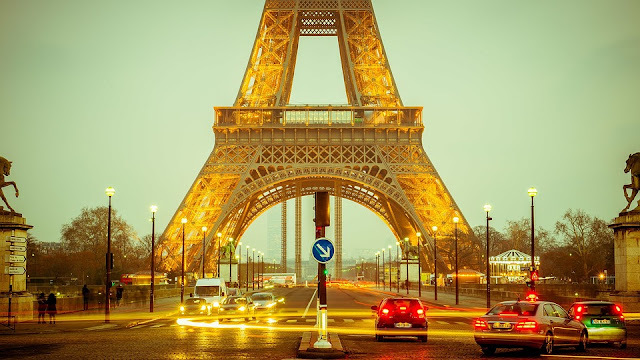 It has since been repainted a total of 19 times, approximately every seven years, and its color has changed from red-brown to yellow ochre to chestnut brown and is today a bronze Eiffel Tower Brown. -- In this first general history of the Eiffel Tower in English, Jill Jonnes - acclaimed author of Conquering Gotham - offers an eye-opening look not only at the construction of one of the modern world's most iconic structures, but also the epochal event which surrounded its arrival as a wonder of the world. In this marvelously entertaining portrait of Belle Époque France, fear and loathing over Eiffel's brash design share the spotlight with the celebrities who made the 1889 Exposition Universelle an event to remember - including Buffalo Bill and his sharpshooter Annie Oakley, Thomas Edison, and artists Whistler, Gauguin, and van Gogh. Eiffel's Tower is a richly textured portrait of an era at the dawn of modernity, reveling in the limitless promise of the future. • Eiffel Tower in Paris France -- High quality printed canvas stretched and stapled to durable shrink resistant frames. 1.50" thick stretcher bars for gallery quality profile. Canvases are printed and hand stretched in the USA by professionals. • The Tallest Tower: Eiffel and the Belle Epoque -- The Paris Universal Exposition of 1889 marked both the centennial of the French Revolution and France's recovery from the humiliating defeat of the Franco-Prussian War. Gustave Eiffel's thousand-foot tower celebrated both those events. But the tower was a stunning accomplishment in its own right, the tallest structure made by man. It was as provocative as it was ambitious. Richly illustrated with historical documents, this is a fascinating look at the tower and the rich socio-economic context which made it a symbol of the Belle Epoque. - Terri Schiavo Life and Hope Network, in collaboration with Priests for Life, announces the, International Day of Prayer and Remembrance for Terri Schindler Schiavo, and All of Our Vulnerable Brothers and Sisters, (Terri's Day! ), which will be observed each year on March 31st, the anniversary of her death. - Some people (me!) can't conceive of eating raw clams, preferring theirs fried, baked, or boiled, or merely added as another ingredient to chowder or pasta. Today is a chance to try something daring by eating clams the way sharks and squid do, raw and in their natural packaging (well, half a shell, anyway). - Celebrate the end of March by enjoying color! Draw a colorful picture, wear something bright... enjoy the colors! - On this day, pay tribute to the humorous nature of women, by listing the top five ways in which women in your life make you laugh. - In the 17th century, the French philosopher René Descartes came up with the explanation for it all : I think, therefore I am. Descartes was born on March 31, 1596. - Celebrates the birthday of its creator. German chemist Robert Wilhelm Eberhard von Bunsen was born on March 31, 1811. And, you guessed it, von Bunsen created the Bunsen Burner.